Home » Face » BB Cream » The Garnier BB Cream (Asia Version) promises 10 in one benefits : Does it deliver? On top of that, it also promises you amazing fairness (hence the “Light” in its name). Me = Sceptic. So, I’ll let you judge for yourself with this before and after picture. You can see my skin imperfections in all their glory – pigmentation on the cheeks, and pimples and pimple marks on the chin, redness around the nose area. I will concede that the Garnier BB Cream is a dab hand at covering up redness. You can see that the redness is markedly reduced on the skin and naturally therefore, the skintone looks more even. The tint in the Garnier BB Cream tends to a slight pink based cast which does adjust itself somewhat to give a slightly brighter tint to the skin. 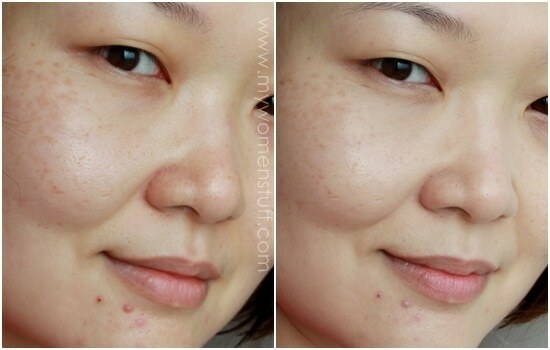 However, dark spots aren’t covered and neither are imperfections. Pores are slightly reduced. On the whole, I’d say that there is a slight improvement in the skintone overall, but coverage is very very sheer. I do rather like how it evens my skintone out quite well, so I take care of the rest by using concealer. A swipe of loose powder over my face to set it, increases coverage and keeps it on longer. If I do not set it with powder, I do find that it will slip by the end of the day. It does not turn my skin very oily – a little but nothing dramatic – but I will warn oily skinned gals about this. If you have combination-dry skin I think it will work better than if you had oily skin. A light dusting of powder helps me take care of the oiliness. Its tone is pink based as I’ve noted which can help with skin brightening. However, if you have a very warm or very yellow based skintone, it may not suit you. The tint looked dark initially for me, but I did notice that it self adjusted quite well after a few minutes so it did match my skintone ultimately. That said, it must be noted that my skintone is light, and this only comes in 1 shade so I’m not sure if everyone can use it. Like all BB Creams, I do not treat this as a skincare item but as makeup. Therefore in my case, I apply this after my skincare routine and sunscreen. 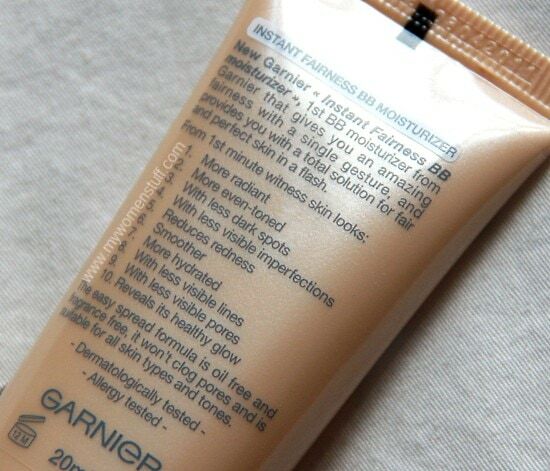 The Garnier BB Cream is very sheer and does not cover imperfections on my skin. It however covers up redness and evens out the skintone and generally helps my skin look a little brighter. I did not notice any skin lightening but it did look dewy without looking like an oil slick. It also did not make my skin very oily throughout the day. I usually use this with a dab of concealer and a light dusting of powder for all day wear. I don’t think those with very oily skin will take to this or those with very warm or yellow skintones. Otherwise, I think its an affordable product that does a decent job. Here are some comparison swatches for your viewing pleasure. The Garnier BB Cream is a tad pinker in tone compared to the Maybelline BB Cream but not as pink toned as the Sunplay Skin Aqua Silky BB Cream. The Hada Labo BB Moist Cream is significantly more yellow toned. I decided to compare apples with apples so they were compared with pharmacy based brands as opposed to mixing in higher end brands. The ingredients are also different so the irresistible conclusion is therefore that whilst they may have the same name and perform the same functions, the two products are quite quite different to suit the different needs and requirements of the different areas they serve. Have you gone and picked this one up already? Its available in local pharmacies so you can take a gander at it to see if it might be something that suits you or that you might like. I experienced no unnatural breakouts with this one. I’m not the biggest BB Cream fan out there but I do think this rather decent for weekends and suchlike. Otherwise I do still prefer using a foundation. Garnier BB Instant Fairness BB Moisturizer retails at RM19.90/20ml at all major pharmacies. It comes in 1 shade. PREVIOUS POST: Do you baby your bags, shoes or accessories? I’ve given up on BB creams, being too dark for them. But this may have piqued my interest, hmmmm…. Hmm… maybe it’ll be too light for you too unless they come out with a darker tone. Not sure if they plan to though. for the price it is even cheaper than most sunscreens! well who knows some may just use this as moisturizer+ sunscreen and skip the 2? I’ve enough of bb creams (for the face). I’m thinking of trying out the Garnier BB cream (Comes with roller ball application. Is roller ball applicaton making a comeback from the 80s cheap roller ball tasty lip glosses?) and Lancome BB base for undereyes. But am i falling for a few gimmicky tricks here? 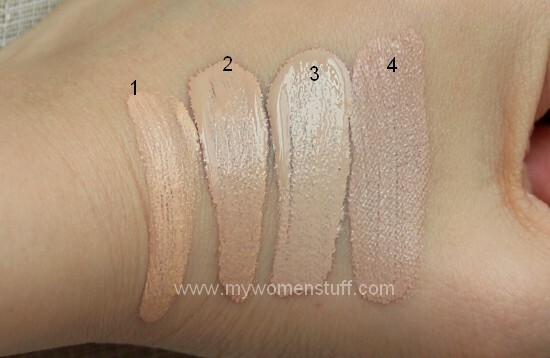 I am thinking about picking up the Medium Shade at Boots – thanks for the great review¬! Will be looking forward to your thoughts on it Jamilla! 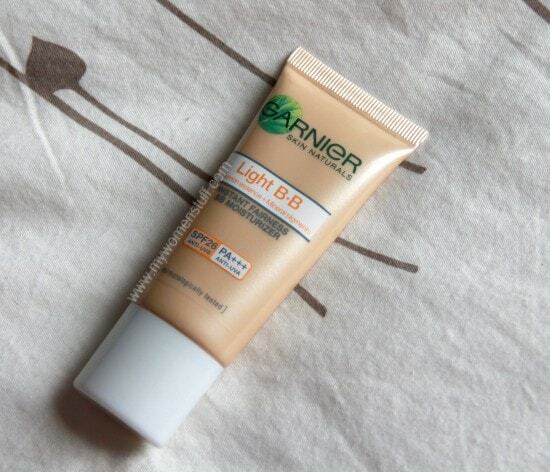 I don’t understand why are Garnier Asian and European BB Cream so different? i think it’s because europeans are not interested in the whitening effect, especially northern europeans who try really hard to achieve a tanned look. i’m from southern europe, i have to order whitening cosmetics on the internet (i have brown spots too despite my very fair skin tone, my face and hands also get really red and i don’t know what to do, lol like my blood vessels are exploding). i think bb creams are interesting especially because of the sunscreen (i have a svr spf50+ tinted cream, though, but when it oxidizes it becomes a little dark..) and the lightening effect. i ordered the skin79 diamond prestige, hope it works for me! I feel like I’m out of the loop because I just learned about BB Creams this week in a magazine article, and this is the second blog post today where I’ve read about them. I guess I should try one out soon! though the shade seemed too light (shade) upon swatching. I could still pull it off, appling a thin layer, due to its sheerness! Hi there, i was google-ing for bb creams and chanced upon your blog. I found this product interesting so i headed down to Watsons with the intention to get it. It costs, SGD18.90 here for the same 20ml!! I find that quite expensive for such a small tube. But I do see that it does make your face look smoother especially around the nose. Do it think it’s worth it for me to buy? u rather prefer?The bb cream from Maybelline or this one.? I have dry combination skin. 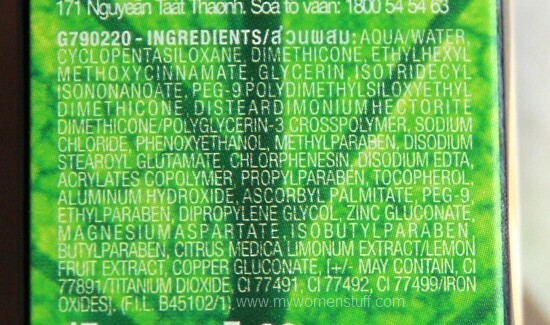 Which is safe to use to prevent acne`s,? Thanks! I’ve got a question…are you sure you got the Garnier BB Cream for RM19.90/20ml? Because yesterday I went to Watsons and the price was RM69/30ml. So I wanted to ask where did you buy yours from? Honestly, if you want the real deal, then you need to get it from Korea. BB cream has been incredibly popular in Asia for a few years already, so they’ve got quite a bit of experience behind it. I personally think brands like MISSHA and Etude House from Korea would be much better than Garnier’s one… Hanskin, Skin79 and BRTC are pretty popular too, but MISSHA is apparently the best. but… I don’t think i will ever try their BB cream. Had bad experiences with 2 drug store brand BB creams already, Vichy and can’t remember the other one. But Vichy doesn’t have the consistency and it sort of made my skin appeared flaky (although I don’t have dry skin, weird). & im quite satisfied with it. the foundation will become uneven because the sweat wash it away. i want to ask…my face felt slightly pain after using any garnier products..maybe because my face turns thinner after using many products before? or it just my skin sensitivity which indicate thats these products are not suit to me…?